Harry Kane celebrates giving Tottenham the lead on Saturday. 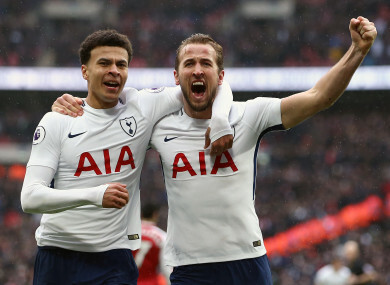 HARRY KANE GAVE Tottenham’s top-four hopes a lift as his header secured a 1-0 win over rivals Arsenal on Saturday. The England striker powered home Ben Davies’ cross in the 49th minute to avenge Spurs’ 2-0 defeat at the Emirates Stadium in November in the first north London derby to take place at Wembley since 1993. The victory lifts Mauricio Pochettino’s side into third place in the table, having played a game more than Liverpool and Chelsea, while Arsenal slip to six points adrift of the coveted Champions League spots. Arsene Wenger named Pierre-Emerick Aubameyang, Henrikh Mkhitaryan and Mesut Ozil in attack but the Gunners looked a shadow of the attacking force that put five past Everton last week. Spurs likewise had few chances in a poor first half but Kane made amends with his 23rd league goal of the season, his seventh top-flight derby strike in as many games. The home side missed good opportunities to extend their lead but they rarely looked in danger of conceding an equaliser, as Arsenal slipped to an eighth loss of a league season that looks set to end in disappointment again. Both teams struggled in a turgid first half, although Kane wasted a glorious opportunity 25 minutes in when he headed Christian Eriksen’s cross over the bar when unmarked near the six-yard box. The Gunners’ final ball was far too often letting them down on their rare forays forward, with Mkhitaryan particularly guilty of some poor crossing from promising positions, although Dele Alli likewise failed to pick out Eriksen at the end of a promising Spurs move. Four minutes after the break, though, Spurs found the breakthrough. Davies was given space to left of the area to swing in an inviting cross, and Kane rose highest to power a header into the bottom-left corner. Kane should have scored again three minutes later, glancing a free header wide after Eric Dier was allowed time to cross, and Petr Cech palmed away a fierce half-volley from the striker as Spurs went in search of a second. The Arsenal goalkeeper, who has now gone nine games without a clean sheet to leave him on 199 in the Premier League, then had to tip over an Eriksen free-kick from 20 yards to keep his side in the match. Wenger made an attacking change, bringing on Alexandre Lacazette for the ineffective Mkhitaryan and Alex Iwobi for Mohamed Elneny, but it was Jack Wilshere who nearly equalised with a curling strike that Hugo Lloris clawed away from the top corner. The visitors were starting to look exposed at the back and Spurs wasted three chances on the break, with Son blazing over the bar, Alli prodding wide when one-on-one with Cech and substitute Erik Lamela seeing an effort blocked wide at the right-hand post. Lacazette spurned two chances to prove Arsenal’s hero in the closing minutes, volleying way over the bar before side-footing well wide after escaping Davinson Sanchez, as Spurs held on for a win that takes them a point above Liverpool and two clear of Chelsea, although both have a game in hand. Email “Kane header settles London derby to lift Spurs into third”. Feedback on “Kane header settles London derby to lift Spurs into third”.